The Nokia Lumia 735 is built from the inside out (researched and designed around the user) with the latest Windows Phone 8.1 operating system. It provides one seamless experience across all your business devices, ideal for sales managers and business owners who require a mobile office. Cortana is your own personal voice assistant who can help you remember the important things in your busy life. She learns about your interests and who is in your inner circle, that way she can remind you of the important things you wanted to say to your business colleague when they call and text. 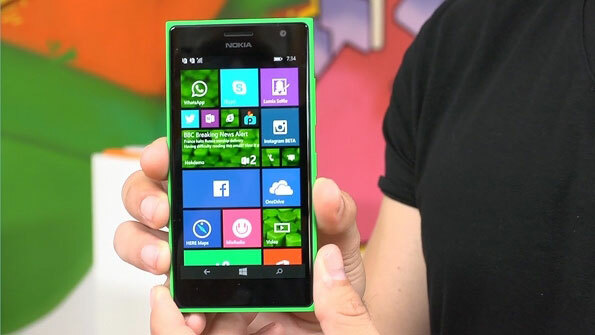 To be able to use the personal assistant feature on the Nokia Lumia 735, you will need to have a Microsoft account. With a 5MP full-HD front-facing camera that combines with a powerful processor, superfast 4G connectivity and Windows Phone 8.1 software, this smartphone will allow you and your team to set up and take part in video conference calls while on the go. Including OneDrive with 15GB of free cloud storage you can instantly and securely save and access documents from your phone, PC and tablet. Similar to iCloud and Dropbox sync all your files and documents on all devices truly making your office mobile. This latest smartphone from Nokia, now owned by Microsoft, is available on a number of tariffs depending on your business requirements. Call our office today for more details and we will help you design a package to suit your business requirements. The Nokia Lumia 735 is suitable for business owners in Northern Ireland who need all their office requirements on a powerful device. The smartphone is perfect for Microsoft Office 365 customers who can access mail and documents when on the go. Contact us today if you would like further information on business telecom tariffs and price packages available or to discuss further your communications requirements.